Matsukaze is a story of two beautiful sisters who met and fell in love with a young courtier in exile at the seashore of Suma Bay. The sisters were “shio kumi”, the saltwater bearers who made their living by ladling seawater (before it was boiled down to salt). Matsukaze is the name of the older sister and literally means “wind through the pine trees”. Matsu (pines in Japanese) also means “to wait”. The name of the younger sister is Murasame (passing rain). After three years in exile, the courtier was pardoned and left the bay and sisters to return to Kyoto. Left behind was a shosoku (nobleman’s cloak) and hat draped on a pine tree. 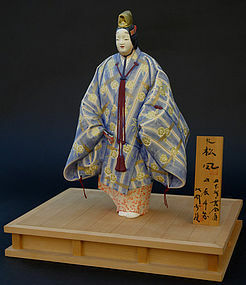 The doll is modeled from the Noh play, “Matsukaze”. In the story, a traveling monk met with the spirits (ghost) of the sisters who linger around the bay area waiting for their lover’s promised return. Matsukaze dances while wearing the lover’s cloak and hat, sometimes passionately and erratically like a mad woman. The play ends with the monk returning to the bay the next morning. There were no shadows of sisters. He only feels the breeze coming from the pines (Matsukaze) and the dampness in the air left behind the rain shower (Murasame) that they had the night before. Large Hakata Doll, Noh "Shishi-mai" Dance Japanese Hakata Doll, Large Bijin Ningyo, Early Spring Hakata Ningyo Japanese Clay Doll, Tea Master "Rikyu"